SIZED TO PENETRATE THE TOP GUIDE AND CORE PLATE FOR BWR BOTTOM OF VESSEL EXAMS WITH GUIDES AND PLATES INSTALLED. The Phantom® FireFly is a small, portable system whose primary visual exam task is the steam dryer, and is sized to reach the bottom of the vessel via stub tube or a removed fuel bundle. With no electronics in the sub-unit the Phantom® FireFly maintains reliability in areas of high radiation. 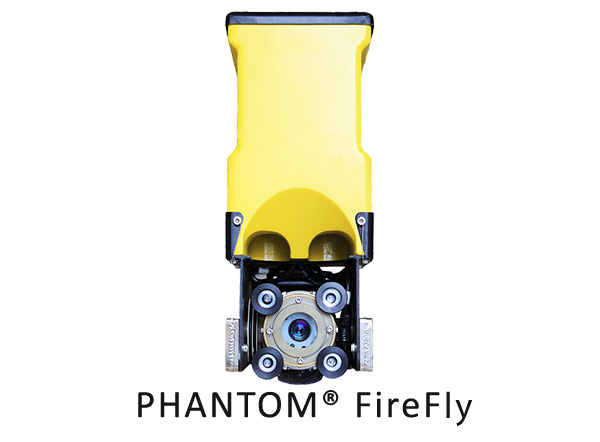 The Phantom® FireFly operates with the NIS-300 Control System; A digital control system designed to be backwards compatible with all existing FireFly ROVs in the fleet and a smaller, more concise topside controls package. Multiple video formats (single coax, Y/C and 1080P) are supported.